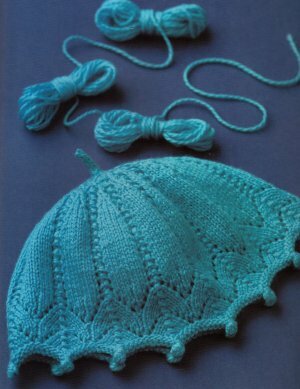 Taken from 60 More Quick Knits: "Wear this feminine cap while out courting with your Romeo. An I-cord stem worked after the crown is knit tops off this dainty topper." This pattern is from 60 More Quick Knits, pg 157 - Juliet Cap. Size US 4-16" circs & US 4 DPNs (or size needed to obtain gauge) are required but not included. Gauge: 28 sts over 4"
Color shown is #8906 Blue Topaz, this color is not currently available, but we have many other color choices! $5.25 -- Kit price including yarn only (no book or pattern).